No, I haven’t been on vacation since the middle of May. Well, actually I did go away with family for a week at the beginning of July to a beach house in Galveston. Just a week though. Otherwise I’ve been making good progress on the eleventh icon (Ocelotl-Jaguar) for my YE GODS! coloring book and restoring photographs by the dozen for a biography of my mother, which I hope to finish by October and publish under Writing. As if that weren’t enough of an excuse for no blog postings these three months, I’ve also been dealing with some medical issues I won’t bore you with, except to say they involved surgery and prescription for a blood thinner. No fun whatsoever. Meanwhile, I’ve wondered what to write about next. I considered a lament about the current sad climate for dance in Santa Fe, but you don’t want to read about my withering opinion of what they’re calling nightlife and dance music nowadays. Rants about today’s absurd political situation seemed particularly egregious, and philosophical essays seemed pointless. I’ve been planning to write about 30 years ago, but that purely autobiographical subject, while formative and somewhat dramatic, isn’t all that exciting. So I’ll fall back on my eccentric art for a topic. 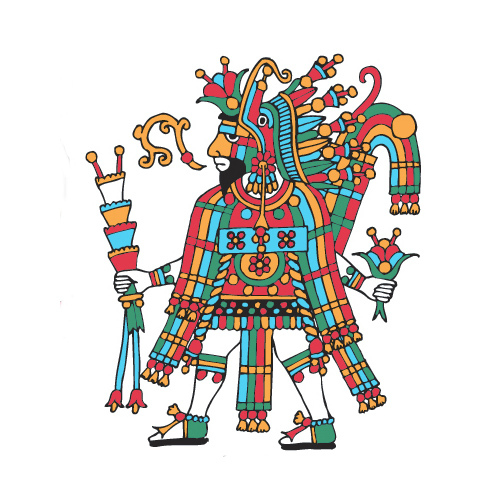 Sorry about taking so long on the Ocelotl icon, but it demands an exorbitant number of elements. The Jaguar being the Aztec’s main animal deity, lord of the animals, I’ve got to include as many of the animals indigenous to Mexico as I can manage. It’s been a hoot drawing them: armadillo, peccary, xoloitzcuintli, quetzal, turkey, iguana, tortoise, coati, etc. There are several yet to go, like pelican and giant anteater. It will present the Mesoamerican biota of creatures of the land, air, and sea. 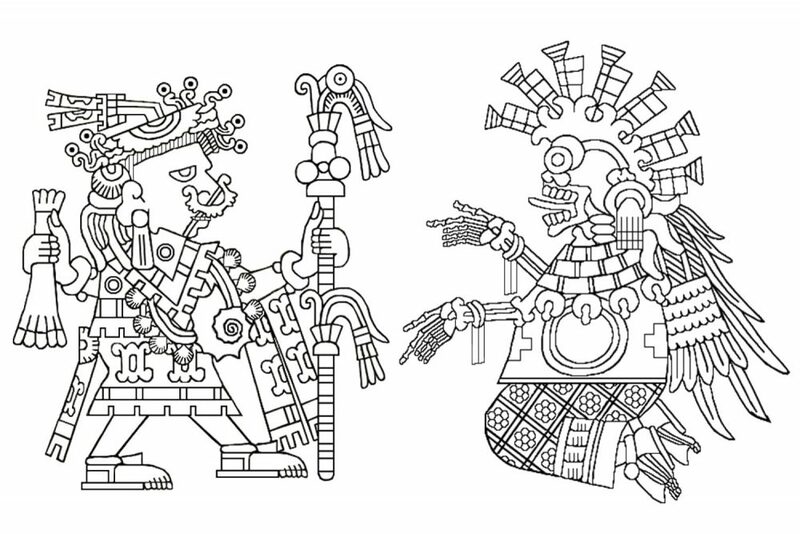 To show this inclusiveness, I’ve drawn Tlaltecuhtli, the androgynous deity of the earth (the land); Quetzalcoatl, the composite deity of the sky (the air); and Huixtocihuatl, the Lady of Salt (the sea). In addition, in the tenth icon of Mictlantecuhtli I included a new cameo of the Lady of the Land of the Dead, Mictlancihuatl.